One of my favorite memories from my childhood is when my mom would take me to the thrift store as a special treat. We’d go & browse through the racks together for vintage gems that I’d happily buy with my allowance & proceed to play “dress-up” in for hours on end. If I had to pinpoint it, I’d say that was when my love affair with fashion began. The gift my mom gave me by taking me on those outings was teaching me that it wasn’t about having the nicest, most expensive things or buying name brands – it was about appreciating clothes that were one-of-a-kind & that made me feel beautiful. 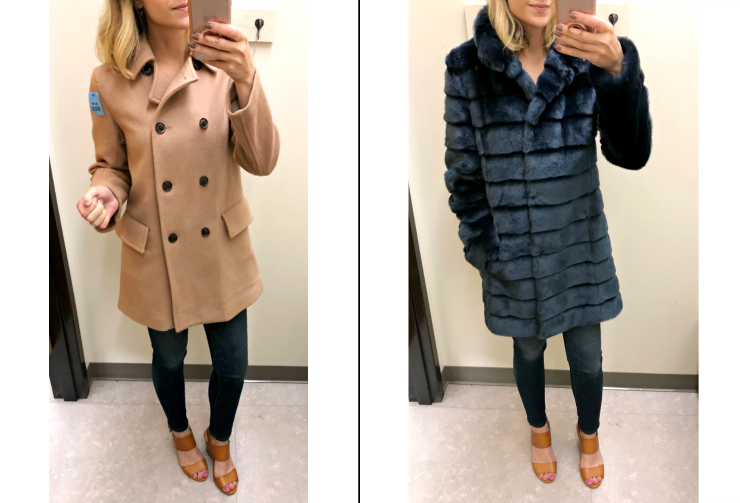 Isn’t it crazy to think that you can get a winter coat for less than $10? And both of these looked brand new! Outerwear is always one of the first sections I check because coats often don’t show signs of heavy wear and these classic silhouettes never go out of style. They had a great selection of kids’ coats as well! Layering is my favorite way to add interest to fall looks and, when you stick to neutral basics, you can mix and match them in a million different ways with pieces you already own. Chambray shirts are usually good thrifted finds because the denim tends to get even softer & more broken in with repeated wear/washing. And how perfect is this cozy grandpa cardigan sweater? It came home with me! 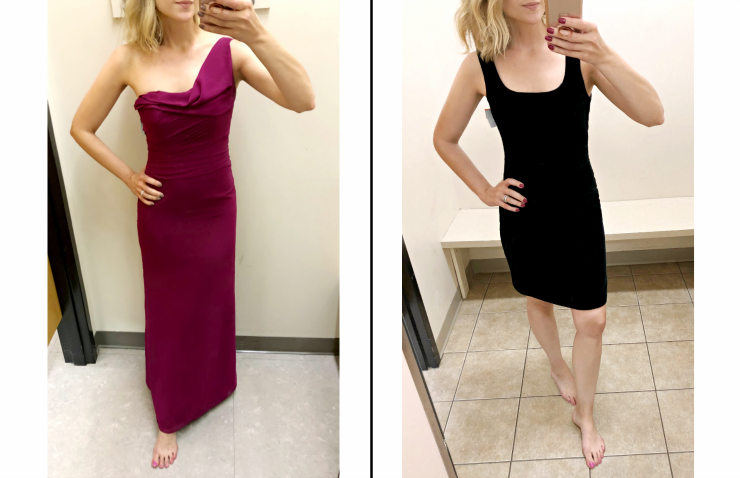 I don’t have the need for a lot of evening dresses, but I couldn’t believe the prices on these – they honestly looked like they had never been worn! If you need something for a black tie event and your budget is tight, I highly recommend checking your local thrift store. I told my daughter that this will definitely be our first stop when it’s time for her to shop for a prom dress (in a couple more years). I couldn’t resist the retro vibe of this little floral dress & it fit like a glove! Remember with dresses that you can always have alterations done after you purchase if it doesn’t fit right off the rack (definitely worth it if you find a style that you love). I also liked the unique print of this skirt, which was perfect for pairing with a classic cable-knit sweater (but would also be great with an ivory silk blouse). 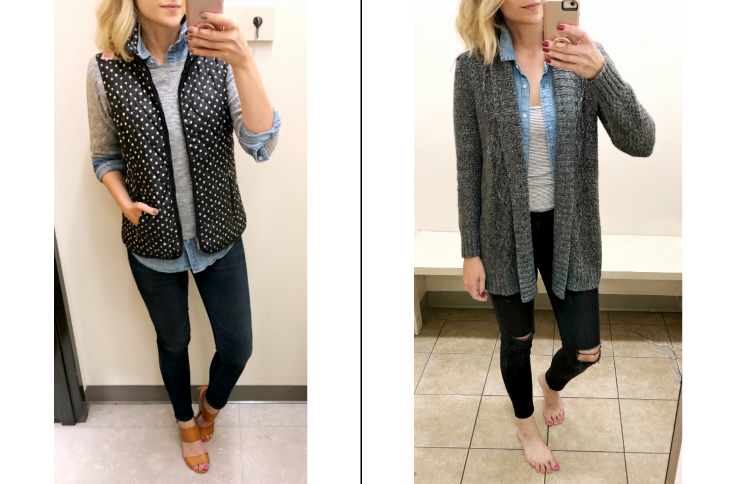 Similar to what I mentioned about outerwear, classic jackets & blazers are great to look for when thrifting because these are timeless wardrobe staples that haven’t changed a lot over the years. This black tweed jacket can be dressed up or down and this glen plaid blazer is so on-trend this season! There are plenty of times when I’ve thrifted with high hopes & walked away empty handed – that’s all part of the hunt! That being said, I’ve definitely experienced the most success when I shop more frequently. Check with your local store to find out how often new donations are processed and put on the floor & try to visit once every week so you can catch those brand new items when they hit the racks. In most cases, people will donate to the thrift store nearest to their house, so I recommend visiting different locations to find the best inventory. For example, I drove to 3 stores and the upscale neighborhood near me ended up having more designer labels and a higher number of pieces that were brand new with tags. A quick visit to the Goodwill website will help you locate all the retail stores in your vicinity so you can easily map it out. Because sizes vary greatly from brand to brand, I always recommend checking at least two sizes above what you normally wear (this is especially true for knitwear & cotton pieces, which tend to shrink with washing/drying). There are also some special vintage pieces to be found and, as we all know, vanity sizing was not as prominently used back then (these items can run 4-6 sizes smaller than what we’re used to now). So many garments have great potential if you can see past a few surface flaws. Because items are not laundered after they’re donated, they might have a strong perfume, must or detergent smell – all of these can be remedied with a quick wash or a trip to the dry cleaners. If you’re shopping for knitwear and there’s pilling, remember that a simple once-over with a sweater shaver can solve this. Other pieces might need simple updates like swapping out the buttons, removing shoulder pads or having a hem re-sewn. And if you find an amazing steal like a wool coat or leather skirt that’s too large on you, find a great tailor who can alter it to a perfect fit. Everything I found was under $15, so even when you add in the cost of alterations, it’s still less than you would pay in a traditional retail store! Disclosure: Goodwill provided me with a gift card to shop, but I was not paid for this post.